I decided to treat myself to lunch and a beer at the Petrol Station on Saturday after getting a few chores done around the house. There's nothing more satisfying then a well deserved beer. I rarely get over to the Petrol Station as its nowhere near where I live, work or normally hangout in Houston. On my last visit, I had the curry chicken salad sandwich which was excellent. 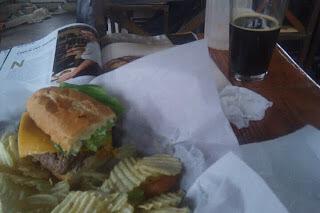 I've heard great things about their burgers, but I decided on the meatloaf sandwich instead with a pint of the Palo Santo Marron from Dogfish Head. The slab of meatloaf was thick and juicy and served in a crusty french roll. The Palo Santo was very smooth for being 12%ABV. Flavours of caramel, vanilla, oak and dark fruits. I followed that up with a Bear Republic Heritage and then a Moylan's Hopsickle. The Hopsickle was a complete hop bomb after the sweeter Palo Santo and Heritage. The place is definitely worth getting over too. Can't wait to try it when the weather is nice and I can sit outside on the large patio areas. Check their Facebook page for information on upcoming events and updates of what's currently on tap.